Portia Mensah ’19 spent a semester working alongside teens in an urban school in the Twin Cities and literally walked in the footsteps of a homeless person. Tyler Aliperto ’19 worked for a political organization which focuses on pending elections and educating others about the candidate’s stances on gender, economic justice, and social justice. 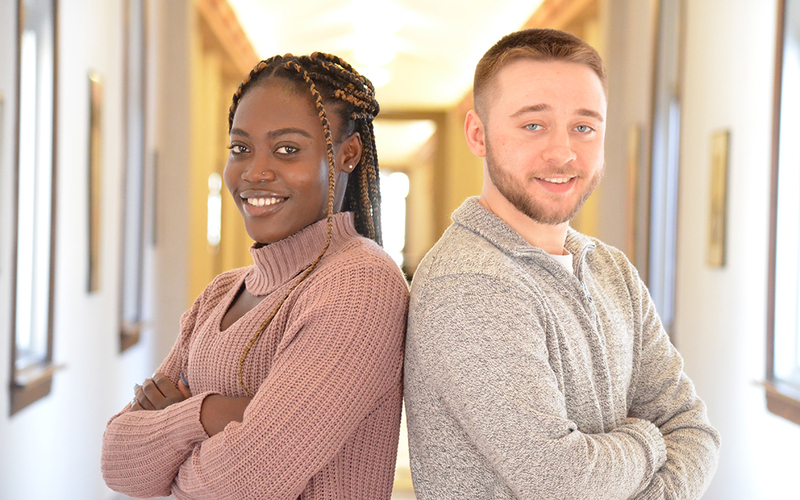 Mensah and Aliperto are two of a growing number of young people with a desire to leave the world a better place — a desire to make a difference. Their recent internships, both completed with the Higher Education Consortium for Urban Affairs (HECUA) Study-USA program, fueled this passion. Mensah, a human services-health major from Bloomington, Minn., dreams of being a social worker who works for a non-profit or after-school program with young adults and teens. Aliperto, a senior journalism major from St. Paul, Minn., also wants to work with youth. By becoming an educator in the schools he grew up in, he hopes to be an advocate for his students as well as for teachers. HECUA’s Study-USA program structure includes seminar-style discussions mixed with field visits and guest speakers. By participants’ second week, they are placed at internship sites where they begin working 20 hours per week. Each Study-USA program offers a different theme and experience. Both Saint Mary’s seniors chose “Inequality in America,” through which students examined the growing gap between rich and poor in the United States as well as gained concrete change-making skills through internships and discussions with effective activists. During her internship at Avalon School in St. Paul, she worked closely with high school students. In addition to supervising about 45 students in the classroom, she tutored in algebra, geometry, pre-calculus, and statistics; shadowed the math teachers; and helped students with homework. She also taught students valuable skills like how to apply for jobs and write papers and other independent living skills. A major project of hers included introducing students to a library in St. Paul where they could find resources for an upcoming project. Aliperto started a “take action squad” and held a few meetings at Saint Mary’s that brought in between 25-35 students each. The group was focused on various governors’ races but also on social justice at the university and the surrounding community. He recommends that college students become more active in elections and not just at the presidential level. “If people our age were playing more of a role, it would contribute to us getting our issues more in the forefront so we could find solutions,” he said.